Need more magic in your life? We have a pair of tickets for you to enter and win to get just that. On Wednesday, 10/17 (that’s tonight! ), Emo’s presents Here We Go Magic at The Parish with Oh No Oh My and Boy Friend. You can also buy tickets, but the chance at an extra pair for FREE never hurts. Full details to enter and win below. 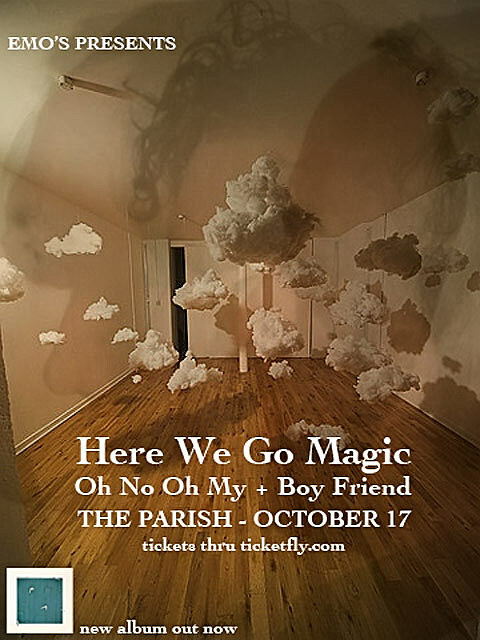 For a chance at winning a pair of tickets to see Here We Go Magic at The Parish on 10/17/2012 : either tweet something that includes both @bvaustin AND “Here We Go Magic at The Parish” in the tweet, or send an email to BVCONTESTS@HOTMAIL.COM with the subject line “Here We Go Magic Austin“. Include your first and last name in the email. We’ll pick a winner at random and contact them with more details. If you enter by email, it will not be shared with anyone else. Good luck!